Are you losing a lot of appointments just because they are coming after your working hours? Do you think you should do overtime to get more appointments? The time you spend asking yourself such questions, you are already losing a lot of appointments, as you are right now. But you don’t have to worry about this particular issue anymore because we have just the right solution for you. InkAppointment WordPress plug-in is a life-savor and in your case appointments-savor for you. 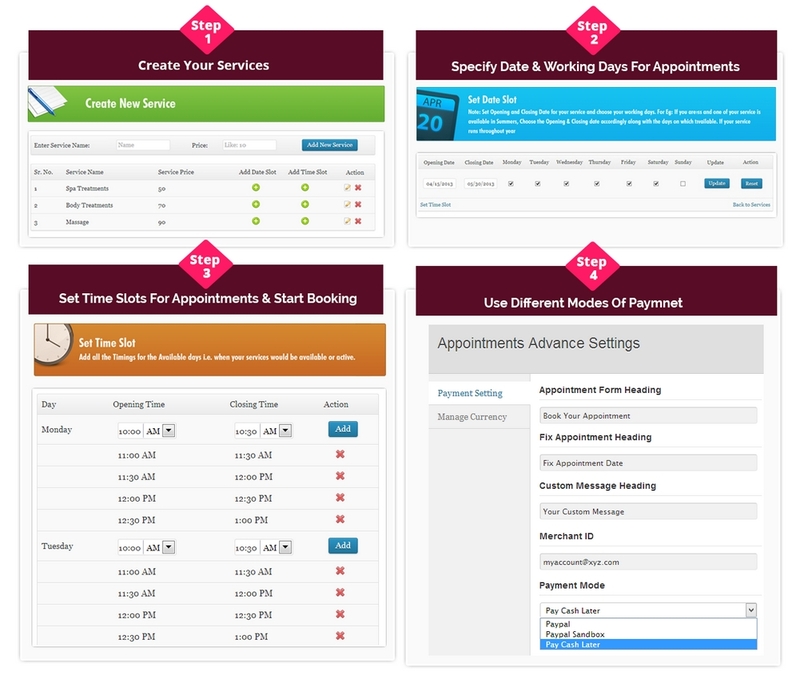 It is actually an appointment booking WordPress plug-in that enables your clients or your customers to book appointments online, that means you do not have to lose any more appointments because this plug-in will receive each and every appointment round the clock and for this it surely doesn’t have to do any overtime. This plug-in is made for everyone, so it doesn’t matter what kind of work do you do and how you do it, this will fill in all your needs. It has some inbuilt features that helps you to easily understand it and you can customize it accordingly. There are these three easy steps to implement this Appointment plug-in to your WordPress site. The first step is creating your services. You have to enter the name of your service and the price you want to charge for it. You can add multiple services too. The next step is specifying dates and timings for your services. You can easily add dates on which you are willing to provide the service in the date section and timings in which the customers can avail the particular service, in the time section. This Appointment Booking WordPress plug-in gives you this unique feature of connecting your payment system with PayPal, with which you can get the payment instantly from your customers PayPal account. It also has the Pay Later feature. You can choose whatever goes best for you. Appointment Booking WordPress plug-in is so user-friendly that even a 5 year old can book an appointment, for his parents probably. Select date and time for appointment. PayPal: Selecting the PayPal option in the Payment mode field will give you the opportunity to get the payment instantly from your customer with their PayPal account. PayPal Sandbox: This payment mode is for the admin. Here the admin can check whether the transaction is occurring correctly or not. Pay Cash Later: If you want your customer to pay the amount after the service is being availed, set Payment mode field to Pay Cash Later. In addition this plug-in provides the admin with the facility to select the currency according to their respective countries. It has options of selecting currencies of 24 different countries. • Appointment dates can be seen in calendar: You can have a look to all the appointments booked by your clients in WordPress Dashboard. All the appointments will be shown with complete details, as filled by the client. You can review the appointments on the basis of days, weeks and months. • Reminder Emails to Clients and Admin: Reminder emails can be set and sent to the clients as well as to the admin before the appointment. It can be set up to 1 week before the appointment. • Disabling appointment booking days in bulk: You can disable the appointments from being booked if you are going out of town or you do not want to take any appointments. • Facility to disable booking dates: Manually disable booking dates out of your working days. • Facility to enable booking dates: You can manually enable booking dates on non-working days in case you want to work more. Last but not the least InkAppointment plug-in will customize your appointment form to make it look better and will enhance its functionality. Additionally, it will make it easy for your clients to book appointments from you and you will be able to get all the appointment without even missing or leaving anyone of them unattended. Moreover it will provide you with a clutter free management and it will have a proper record of all your customers attended or not attended by you. So now stop thinking and start doing, install the plug-in and say good bye to all the worries.